Submitted by glw on Sat, 12/15/2007 - 17:48. This is not to be confused with the recent re-issues with small headstocks and quite frankly wrong-looking scratchplates. 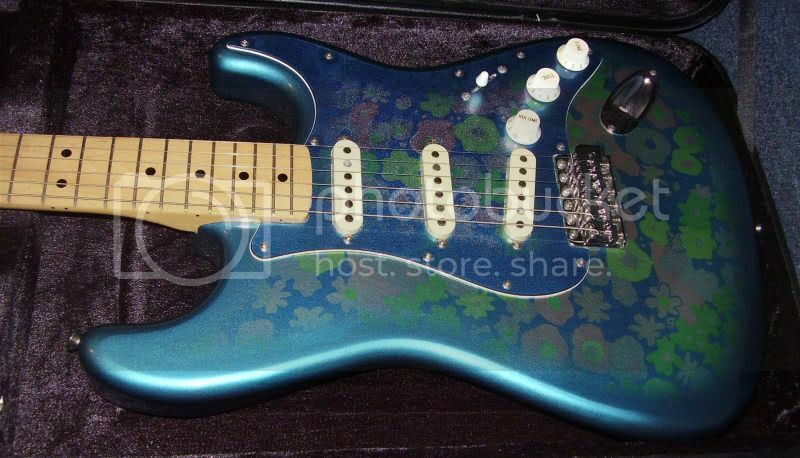 It's one of the original Made in Japan blue flower 70s style Fender Strats circa 1988 and it is in pristine condition. It looks as if it could be new. The only tell-tale signs of age are that some of the pink flowers on the front have faded, and the pickup covers have faded nicely to a creamy green colour that compliments the guitar's finish. It's a real find for me, as I never forgave myself for selling my paisley pink Fender Strat and Tele from the same era. It might be some people's idea of "Worst colour/finish/detail on a guitar", but to me this is a highly desirable piece. Posted by 1bassleft on Sun, 12/16/2007 - 03:53. Posted by lee_UK on Sun, 12/16/2007 - 11:45. Fantastic guitar glw, well done, one of my fav finishes, i bet it plays nice too.